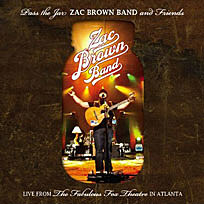 The Zac Brown Band now have two titles among the current best-selling country albums. While their blockbuster CD, 'The Foundation,' drops from No. 2 to No. 3, it still had a five percent increase in sales from last week. And Zac and the guys still hold down the No. 2 spot anyway, with the debut of the live two-CD (plus DVD) set, 'Pass the Jar,' which sold a total of 26,000 copies in its first week, according to Nielsen SoundScan data. Also scoring an impressive debut this week, although not on the country chart, Court Yard Hounds, whose self-titled debut bows at No. 7 on the Billboard 200. The duo's disc sold 61,000 copies in its first week. The next-highest debut on the country chart belongs to Chely Wright, whose 'Lifted Off the Ground,' only managed to lift its way to No. 32, selling 3,000 copies. By comparison, Chely's last studio album, the 2005 'Metropolitan Hotel,' entered the chart at No. 18. The top spot on the country chart, of course, belongs to Lady Antebellum, holding on for the 15th straight week with 'Need You Now,' and staying put at No. 2 on the Billboard 200 with a 28 percent jump in sales from last week. The double-platinum disc sold another 97,000 units for the week.